Imagine being a senior citizen and having to migrate because you can’t find the right medicine to treat your diabetes. Imagine being a father and deciding your family has to leave home because you can’t provide three meals a day. Imagine having to flee quickly from your country because you just got pregnant and you can’t receive prenatal care in local hospitals. The reality is that these decisions have been made by the 3.3 million Venezuelans who have left their country since 2015. 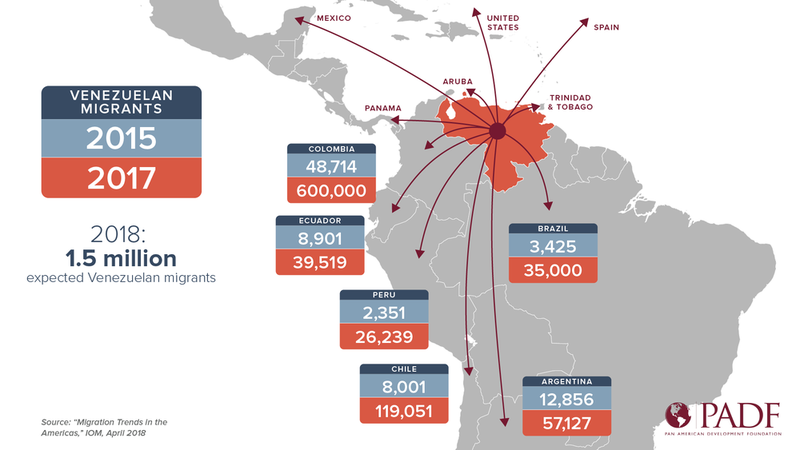 The number continues to grow – 5,000 Venezuelans flee every single day. According to UNHCR, 68.5 million people are displaced around the world – 5% of them are Venezuelan. And if you take into consideration the data that the Center for International Development at Harvard University estimates through social media, the number of displaced Venezuelans increases to 5.5 million. This means that 10% of Venezuela’s population is becoming diaspora. Colombia’s situation is even more drastic. It registered more than 4,000 births to Venezuelan mothers during the past year. Most of these babies are stateless, since Colombian legislation only offers citizenship to children who have at least one Colombian parent. An “invisible generation” of Venezuelans is being born, who do not legally exist in either country.